Last night, as I prepared my evening feed (rice with something), I heard a strange and unfamiliar squeaking sound from outside. I grabbed my head torch (aka.flashlight) and out I went. This is what I found. I couldn’t believe it. 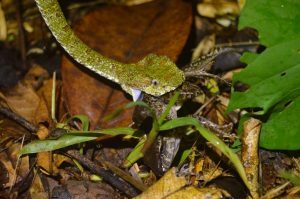 Ever since moving to live on the Osa Peninsula in February, I have been desperate to see the stunning eyelash pit viper (Bothriechis schlegelii), but so far they had eluded me. This isn’t surprising considering their awesome camouflage- forest green broken up with strokes and flecks of red and yellow. 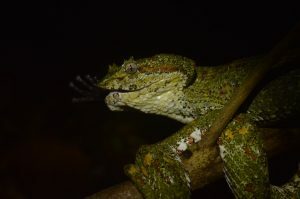 However, this chappie had been given away, by the poor little robber frog (Craugastor fitzingeri) who was now … supper. I rushed back inside, still barefoot, to grab my camera; and for the next twenty five minutes, watched and photographed (without flash!) while the whole process unfolded. Many people believe that snakes can dislocate their jaws, but this isn’t really true. They do however have some unbelievably loose fitting and complex bone structures in the jaw and head. These can expand away from each other and allow the left and right side of the jaws to move independently; left first, then the right and then the left, and so on and so on…until they finally swallow their supper whole! What was strange about this encounter for me was that the snake ate the frog from the back first. 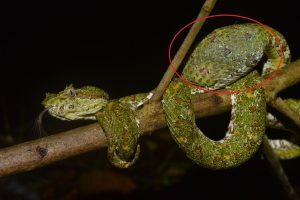 Most snake species will actually make an effort to search out the head of their prey first, and begin swallowing from there, to ensure no problems in fitting awkward pointing limbs in their mouths. Maybe this froggy was small and flexible enough to pose no issues. 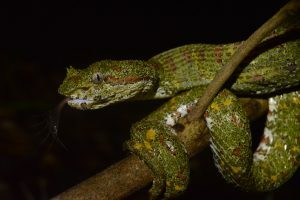 What was very cool though was that as the right sided fang of the snake moved along, a young secondary fang was visible, tucked away in the protective sheath. Vipers frequently lose these fangs and so new ones grow quickly behind. These cheeky little vipers are never caught without their weapons, just in case a meal is rightly available. It wasn’t long until all that was left … was a foot – just hanging from the viper’s mouth. 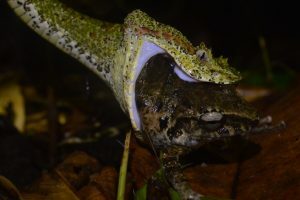 The frog then travelled down through the snakes body, pushed by the rippling muscles and inner organs, where over the coming few days, intense gastric juices would digest the frog, bones and all. 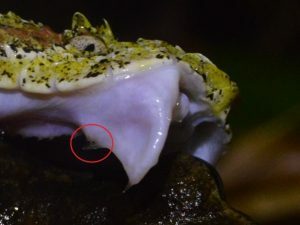 This froggy snack could actually sustain this little snake for the next month at least, if food is scarce- a feat I am extremely jealous of… as I seem to need to feed every couple of hours or so. According to my neighbour and reforestation fanatic, Agustin Mendoza, these snakes aren’t so common in the low lying areas of the peninsula next to the ocean. They typically thrive higher up on Cerro Osa, where there is a cool refreshing breeze; who says snakes aren’t smart?! What an incredible snake and one of my top five herping moments in my life so far!